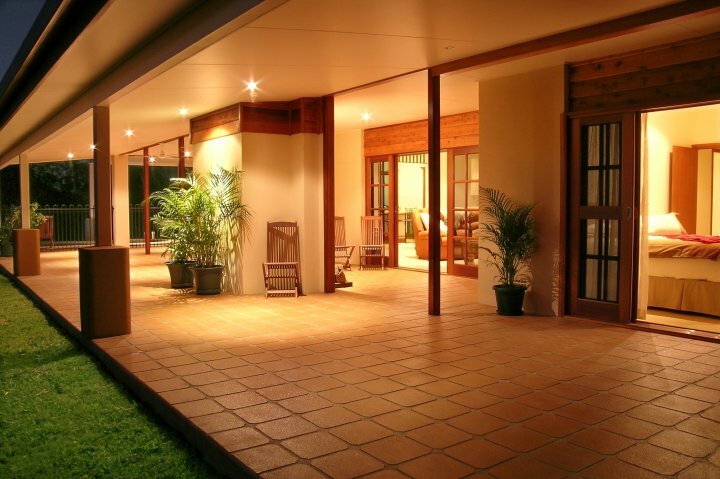 Luxurious setting for a Four Bedroom Retreat and 2 x 1 bedroom apartments. 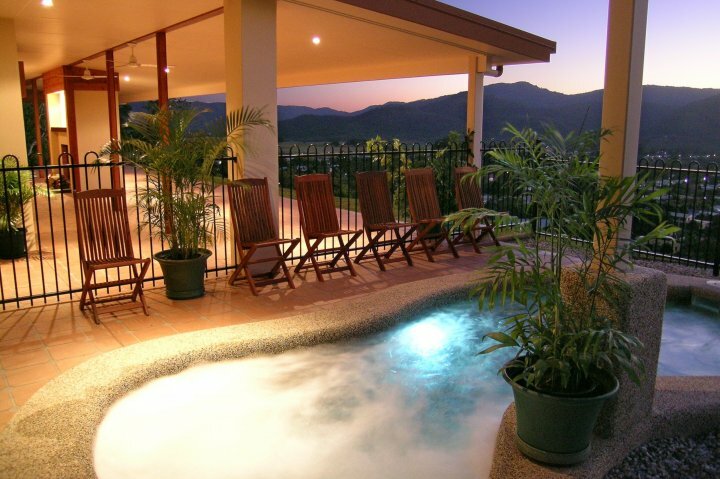 Be assured, each booking for The Summit Rainforest Retreat, has use of the external facilities. pLocated at the highest point in Atherton with wonderful views over the town. pIdeal for singles, couples, families, groups, multiple couples and weddings. pConferences, meetings & seminars can be held at the Summit Conference Centre - see our listing under "Conferences". 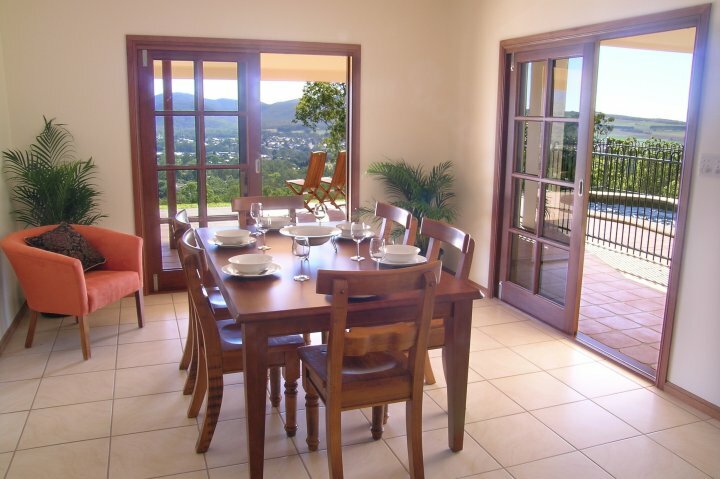 Atherton Blue Gum B&B is also available for extra accommodation and only a few minutes walk away. One BR Apartment 1 BR Apartment has king/split bedroom + 2 single bunk alcove. WiFi, Digital TV, bathroom & kitchenette. The Apartment has a view into the crater with Mabi Rainforest & native animals, beautiful and cool in the hotter months. 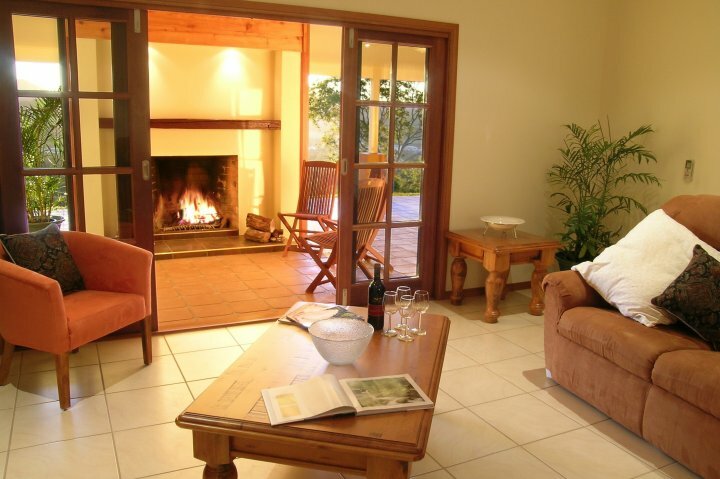 The Apartment shares the use of the Retreats spacious private deck with the B&B rooms.180 deg panoramic views, heated pool, spa, BBQ, laundry & open fire place - extra cost for firewood. Excellent external facilities. Rainforest & lookout walks onsite. 4 BR Retreat Retreat has 3 ensuited BR's all with Digital and/or WiFi + 1 BR's with bunk beds & TV. Central lounge with WiFi TV/DVD, plus extra bathroom. Full kitchen/dining/laundry facilities.Large private deck with panoramic views, heated pool/spa/BBQ/open fire place, extra cost for firewood. Excellent facilities & rainforest walks. One B&B BR A spacious B&B BR with direct access, through sliding doors, onto the deck with panoramic views. It has a king/split bedding configuration. WiFi, Digital TV with ensuite. The room has a view into the valley & surrounding mountains, beautiful and cool in the hotter months due to the altitude of 750 m's above sea level. All B&B rooms & apartment have access to the Retreats huge, spacious deck with outdoor furniture, 180 deg panoramic views, heated pool, spa, BBQ, laundry & open fire place - extra cost for firewood. Excellent internal facilities including full kitchen, dining & lounge areas. Rainforest & lookout walks onsite. 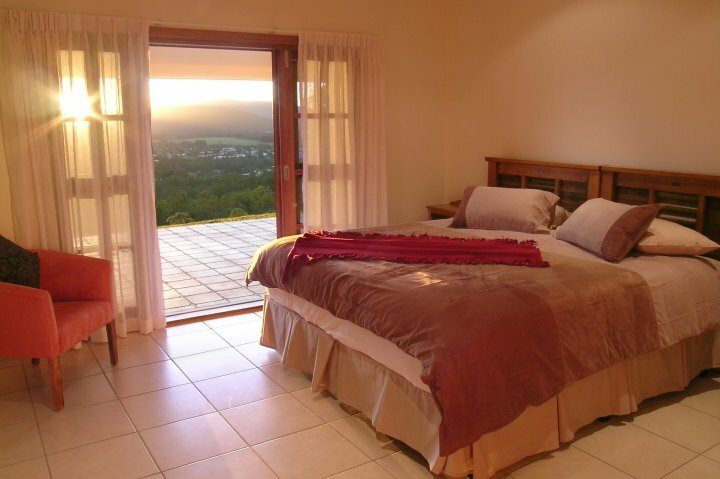 One B&B BR A spacious B&B BR with indirect access onto the deck with panoramic views. It has a king/split bedding configuration. WiFi, Digital TV with ensuite. The room has a view into a fern undercover area, beautiful and cool in the hotter months due to the altitude of 750 m's above sea level. All B&B rooms & apartment have access to the Retreats huge, spacious deck with outdoor furniture, 180 deg panoramic views, heated pool, spa, BBQ, laundry & open fire place - extra cost for firewood. Excellent internal facilities including full kitchen, dining & lounge areas. Rainforest & lookout walks onsite. 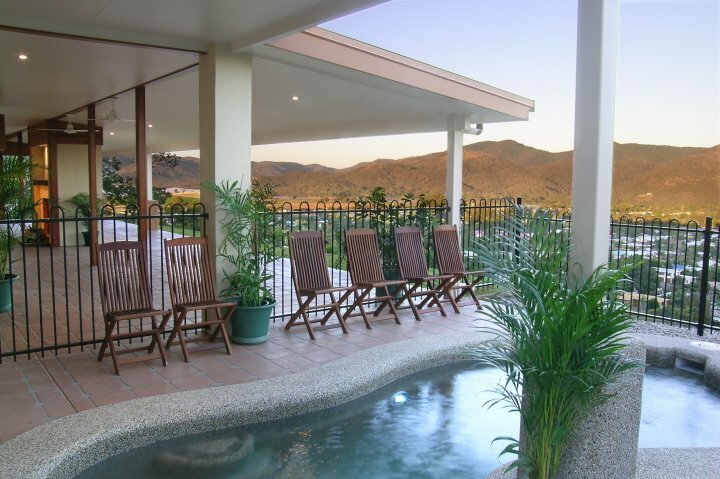 One B&B BR A spacious B&B BR with indirect access onto the deck with panoramic views. It has a Queen bed configuration. WiFi, Digital TV with ensuite. The room has a view into the Mabi Rainforest, beautiful and cool in the hotter months due to the altitude of 750 m's above sea level. All B&B rooms & apartment have access to the Retreats huge, spacious deck with outdoor furniture, 180 deg panoramic views, heated pool, spa, BBQ, laundry & open fire place - extra cost for firewood. Excellent internal facilities including full kitchen, dining & lounge areas. Rainforest & lookout walks onsite. Bunk with Double on base single on top. Continental breakfast provisions included in the tariff. Private bathroom across the passage way, it is not an ensuite. Room next to the kitchen. Cot is available for extra cost. Conference room with data projector, screen, whiteboard, air con, sound/dvd/cd system. Seats 30 in theatre & 22 in workshop configuration. 36 Twelfth Ave, Atherton Blue Gum B&B. Free parking for up to 15 vehicles. Check in for the Summit is at the Atherton Blue Gum B&B. On entry to Atherton, drive along Main Street to the roundabout at McDonalds, then turn left into Robert Street. Drive all the way to the top and turn left into Twelth Avenue. Blue Gum is on the right hand side.